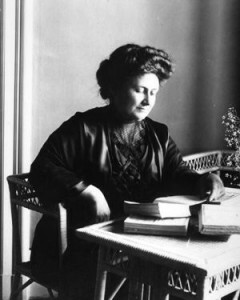 Maria Montessori was born in Italy in 1870. Growing up, she was determined to be anything but a teacher, as was traditional for females of her day. As a result, determination and dedication allowed Montessori to graduate as the first female doctor in Italy in 1896. It was during her early medical career that Montessori first became interested in the education of children. Unlike her peers, Dr. Montessori felt that with a little care and guidance, all children could blossom. She observed and studied children while also analyzing research of other educators to develop her own self-styled pedagogy. Consequently, after only one year, neglected and abandoned children in the hospital asylums were reading, writing and passing the same exams as their peers in the public schools. The developments were amazing! Soon, parents from all walks of life flocked to Montessori. The great success of her methods also shocked the medical and teaching communities. By demand, Montessori opened more schools, which led to the need to train others to continue her work. Dr. Maria Montessori quickly became an international figure. Today, the Montessori Method of Education is thriving in schools around the globe. For more information about Dr. Maria Montessori or her philosophy please feel free to contact Avalon Children’s Montessori in the Beach, Toronto.